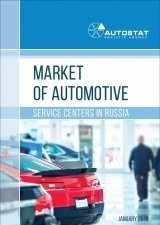 AUTOSTAT Analytic Agency presents the new release of the marketing report "Market of Automotive Service Centers in Russia. This report focuses exclusively on the market of passenger car service centers. Market assessment was carried out in two lines. The first one is the classification of market participants and their proportion in the regions, such as official dealers, independent service centers and specialized stations, which provide limited set of automotive service (e.g., carwash, tire service, electronic control system diagnostics, etc.) At the same time private mechanics were grouped into a separate category, as it is quite difficult to estimate their number due to the lack of information in the public domain. Due to the new information in the report we were able to assess the market participants in 68 regions of Russia. The second line is annual sales of automotive service, including body repairs, carwash and tire works. Method of the market calculation is based on detailed data on car park in Russia on January 1, 2016, as well as monitoring of the prices for automotive service in Moscow, St. Petersburg and the regions. We also took into account car owners’ preferences to kinds of service stations that have been corrected after the polls in 2015. The market volume was divided into three main clusters: official dealers, independent service stations and market potential. Market potential includes repairs and car services carried out by car owners or private mechanics. Every cluster is subdivided into services for domestic and foreign vehicles, as well as vehicle age groups. These two lines of the research enabled us to calculate the average annual volume of official dealer services for one brand without spare part and consumables cost. Moreover, we also calculated the saturation of automotive service centers with warranty cars, i.e. number of warranty cars for an official dealer in every region.